It’s well-known that Queen Elizabeth is a dog-lover, and her longtime breed of choice is of of course the corgi. The Queen’s father King George VI first introduced the corgi breed to the royal family in 1933, and (according to the family pets page of the official Monarchy website) today she owns three Corgis: Monty, Willow and Holly and three Dorgis (a Dachshund-Corgis mix): Candy, Cider and Vulcan. 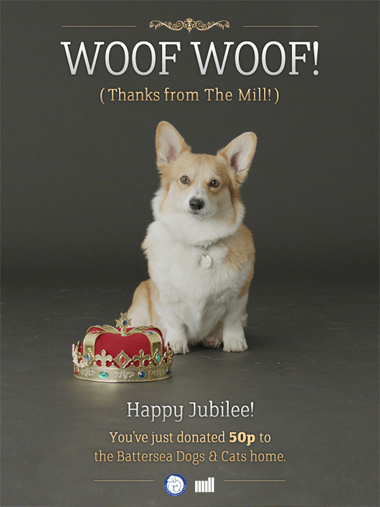 To celebrate the Queen’s Jubilee visual effects company The Mill have created Bill the interactive corgi. They’ve created a temporary home for Bill on a digital screen installed in their windows at 40-41 Great Marlborough Street, London (if you happen to be in the neighbourhood). You can send a ‘tweet-treat’ to Bill between May 28 and June 5 using the @themillcorgi profile and the hashtags #play #eat #chill or #party.